We...okay I...spent some time researching all the options on dirty diaper storage. 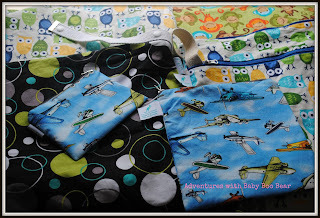 I didn't realize how many choices I had when it came to stinky, dirty diapers! Wet pails that lock or don't lock. Wet bags, dry bags, dry pails, plain ole garbage can, can with a liner, specially designed pail for CD....the list goes on! This was the area I feared would lead me to ditching the cloth. I am very sensitive to scents and the last thing I wanted was to be constantly smelling dirty diapers. In the end we decided to use hanging wet bags. The bag hangs on Emmett's dresser, zipper open, and we just chuck the dirty dipes in as they come! That's it. The wetbag contains the smell for at least 2-3 days. Although, there have been a few times I've had to zipper it up because we've had a particularly poopy day....word to the wise - when you have to open up that zipper don't take a breath...just don't. Trust me. We have 3 large wet bags. We started with 2 but I found I had to use the dryer more often because they didn't line dry fast enough in the winter. So we added our 3rd. Now we have 1 in use, 1 drying and 1 ready to go! We use Sling Sisters and Planet Wise bags. We also have 3 small wetbags to take on outings. Recently we have started using a great product from Rockin Green (go figure). Shake It Up is a powder you just sprinkle into your wetbag or pail to help freshen things up until laundry time. We have the Bare Naked Babies scent (because that's all the store had) but will be getting a scented version next time! I <3 Rockin Green. The nice thing about the wetbag storage is you just throw it into the wash with the diapers. No rinsing out diaper pails here! That's it....our dirty laundry all aired out. Can you get Shake It up at By Nature? I was going to order it on Amazon but changed my mind. I really need o get to By Nature soon! Sure can (I know I answered you already...buuut just in case anyone else was wondering ;) ).